The second anniversary of the Black Forest fire on Thursday brings a deadline for many fire victims: it will be their last chance to sue their insurance companies and their last chance to seek to collect the full amount of money they are owed to replace belongings. 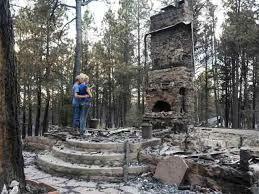 The fire started on June 11, 2013 and burned 14,280 acres in Black Forest, destroying 488 homes and killing two people. Fire victims who are working to settle their claims should ask for an extension of the deadline verified in writing. Most insurance companies will grant them if homeowners request them. If the insurer denies the extension, residents should contact the Colorado Department of Regulatory Agencies, which has encouraged insurance companies to grant those extensions. - Your insurance claim will remain open and payable past the two-year anniversary. - Your insurer will continue to honor its obligation to pay all benefits owing, including replacement values, past the two-year anniversary. - Your insurer agrees that it will not enforce any "suit against us" provision that may arise at the two-year anniversary.